Zari Handmade Beaded Clutch Purse. 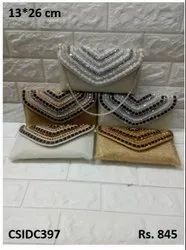 We are manufacturer and exporter for Zari Handmade Beaded Clutch Purse, we have many styles to offer in this category. We can develop any design as per buyers requirements. Chain Length (Inches): 100 cm. This clutch made with distinct combination of mother of pearl shell , metal brass , crystal knob..perfect for all the occasion..
premium quality Clutch Cross Beaded Bag. We are a well-renowned organization in the industry to provide our patrons the best quality array of Ladies Handbag.